UPDATE March 10, 2019: On 10th of March 2019, at 2 a.m., the daylight saving time began in the United States and clocks go forward 1 hour for spring and summer. The daylight saving time for 2019 began on March 10 and it will end on November 3, 2019. Daylight saving time lasts for a total of 34 weeks (238 days) every year, about 65% of the entire year (including leap years). The Eastern Time Zone in US is commonly used by the national media and other organizations as a “national time”. National media organizations will often report when news events happened or are scheduled to happen in Eastern Time, even if they occurred in another time zone. TV schedules, especially those that list events that are broadcast live across the country, are also almost always posted in Eastern Time. The major professional sports leagues also post all game times in Eastern Time. Important: airports, railway stations, and other modes of transportation in the US follow the local time. US national broadcast networks and cable channels generally air at least two separate feeds to their stations and affiliates: the “east feed” that is aired simultaneously in the Eastern and Central Time Zones, and the “west feed” that is delayed three hours for those in the Pacific Time Zone. Time zones used in states beyond the contiguous US: Alaska Time Zone – AKST (UTC−09:00 or UTC−08:00 in Daylight Time) and Hawaii–Aleutian Time Zone – HAST (UTC−10:00 or UTC−09:00 in Daylight Time). Time zones outside the US: Atlantic Time Zone – AST (UTC−04:00), which comprises Puerto Rico and the U.S. Virgin Islands, Samoa Time Zone – SST (UTC−11:00), which comprises American Samoa and Chamorro Time Zone – ChST (UTC+10:00), which comprises Guam and the Northern Mariana Islands. As of August 9, 2007, the standard time zones are defined in terms of hourly offsets from UTC. 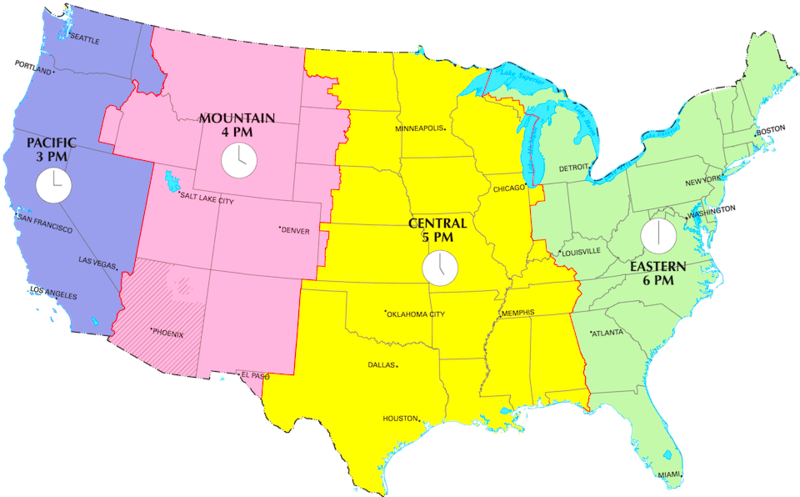 Standard time zones in the United States are currently defined at the federal level by law 15 USC §260. Above all, the federal law also establishes the transition dates and times at which daylight saving time occurs, if observed. It is ultimately the authority of the Secretary of Transportation, in coordination with the states, to determine which regions will observe which of the standard time zones and if they will observe daylight saving time. In other words it is the combination of the time zone and daylight saving rules, along with the timekeeping services, which determines the legal civil time for any US location at any moment. The Energy Policy Act of 2005 extended daylight saving time (DST) for an additional month beginning in 2007. The start of DST now occurs on the second Sunday in March. As a result the end of the daylight saving time is on the first Sunday in November. Clocks will be set ahead one hour at 2 a.m. on March 8, 2020. The clocks will be set back one hour at 2 a.m. on November 1, 2020. Official and highly precise timekeeping services (clocks) are provided by two US federal agencies. The National Institute of Standards and Technology (NIST Clock) is one. The other is the United States Naval Observatory (USNO Clock), for instance.